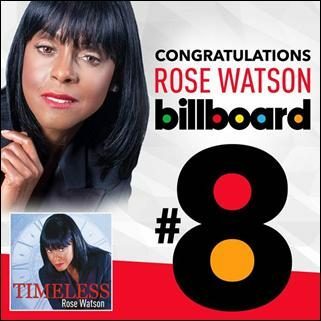 September 27, 2017 -Richmond, VA- Singer and songwriter Rose Watson’s debut CD “Timeless” has topped Billboard Gospel Charts, debuting at number 8 on the list. Just two weeks ago Watson hosted the public launch at the Saint Paul’s Baptist Church, where she currently serves as first lady. She was joined by legendary gospel artists, including minister and musician Marvin Winans, as well as contemporary gospel artist Charles Jenkins. Growing up in Detroit, Michigan and heavily influenced by the music of Motown, TIMELESS reflects the wide span of her musical exposure. Watson’s musical career has its roots in the theater, and spans more than 20 years. Formally educated at the School of the Arts, Virginia Commonwealth University in Richmond, Virginia, she has toured and performed extensively in the USA, Europe, the Caribbean, South America and recently a twelve-week tour in China, belting out songs that thrilled audiences time and time again. She has performed in notable productions such as “Ray” and “Mahalia.” Additionally, she performed in “Oh Happy Day” with Joann Bell, a principal performer in both “Tenoritas” and “Sister Act” during their European tours. Timeless is available for purchase on ITUNES, AMAZON and at retailers nationwide. Rose Watson is a classically trained thespian with a musical theater career spanning more than 20 years. He national and international musical credits include “Little Shop of Horrors, Crowns, Ain’t Misbehavin’, Beehive, Blues in the Night, Songs from the Soul, Tales of Hoffman, the Magic Flute,” and the epic musical, “Carmen.” In addition to her work in the theater, she is an incredible gospel artist, touring extensively with well-known gospel groups and artists in Europe such as the Gospel Pearls and the dynamic Queen Yahna. Rose Watson is not only known as a great talent, but she is increasingly revered as the consummate business woman, serving as leader of The Watson Group, Inc. where she manages talent and entertainment bookings for the company. She is a producer, director, songwriter, model and actress as well who seeks to do everything with excellence, class and to the glory of God. Visit www.therealrosewatson.com or follow her on social media @therealrosewatson.